They were pining for their homes. 彼らはしきりに家を恋しがっていた. He pined to see his wife and children. 彼は妻子に会いたいと切望した. The girl pined for home. 〔植〕マツ(〜 tree)《マツ科マツ属(Pinus)の常緑針葉樹の総称；北半球産；不滅性・長寿, 豊饒(じよう)などの象徴；タールテレビンを採る；花言葉は「同情」「あきらめ」「逆境の望み」； →longleaf 〜, →nut 〜, →pitch 〜, →Scots 〜》；マツ科の他の木や低木の総称. [通例 be pining]〔(特に)得がたいものを〕思いこがれる, 恋い慕う〔for, ((米まれ)) after〕, 〔…することを〕切望する〔to do〕. [通例 be pining]〔…を〕深く悲しむ, 悲嘆する(grieve)〔for〕. ((文))…を悲しむ, 嘆く. パイン《Unix 用の電子メールプログラム; Elm に比べ, 独自のエディターを備えているなどの特徴がある》. From Middle English pyne, from Latin pīnus, from Proto-Indo-European *poi- (“sap, juice”). Cognate with Sanskrit पितु (pitu, “sap, juice, resin”). (countable, uncountable) Any coniferous tree of the genus Pinus. The northern slopes were covered mainly in pine. (countable) Any tree (usually coniferous) which resembles a member of this genus in some respect. (uncountable) The wood of this tree. (archaic except South Africa) A pineapple. From 古期英語 pinian (“torment”), from *pine (“pain”), possibly from Latin poena (“punishment”), from Ancient Greek ποινή (poinḗ, “penalty, fine, bloodmoney”). Cognate to pain. Entered Germanic with Christianity; cognate to Middle Dutch pinen, Old High German pinon, Old Norse pina. To feel irritated; to reflect on a problem; to think something over. To languish; to lose flesh or wear away through distress; to droop. The roses wither and the lilies pine. (intransitive) To long, to yearn so much that it causes suffering. Laura was pining for Bill all the time he was gone. The way the story went was that the man's foot healed up all right but that he just pined away. (transitive) To grieve or mourn for. (transitive) To inflict pain upon; to torment; to torture; to afflict. 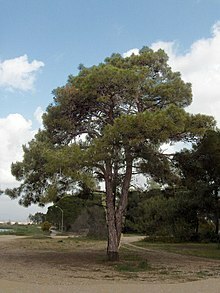 ^ “pine” in Douglas Harper, Online Etymology Dictionary, 2001–2019.